Does anyone else live for soup season? My husband jokingly calls me the soup queen. I’ll gladly wear that crown. They are one of my favorite things to make and eat. Since we live in Texas and it’s one million degrees in the summer, I don’t make soup or chili at all. It’s just too hot to enjoy, so as soon as September hits and rainy days start, soup season, as I lovingly call it, begins. We will have soup or chili once a week until temps rise back up in late spring. 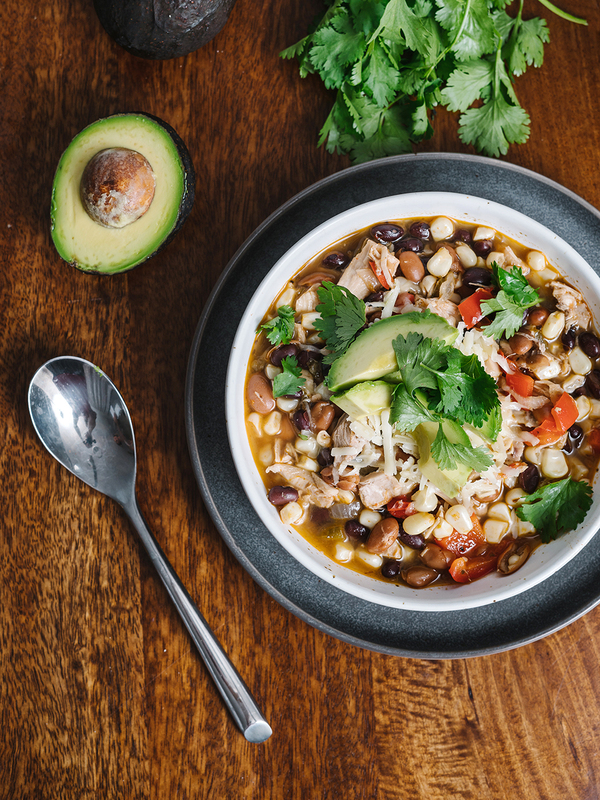 I like that my soup and chili making days are a season, it’s just long enough to not get sick of it but then by the time summer is over, you can’t help but crave it again. This recipe is tangy, rich, spicy and honestly a little confusing because how is it all of those things at once? I love delicious addition of roasted corn. 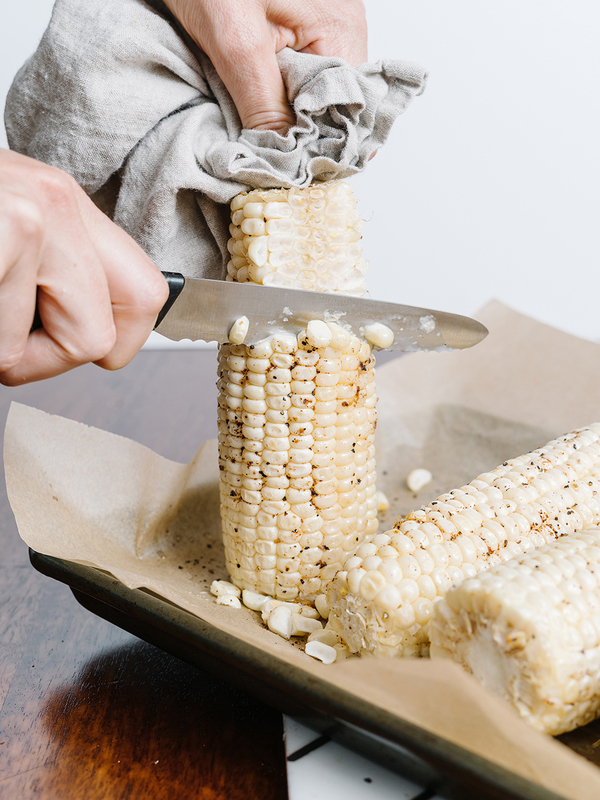 Yes, you can totally use frozen corn instead–but there is literally no comparison in taste. The roasted corn adds SO much flavor. 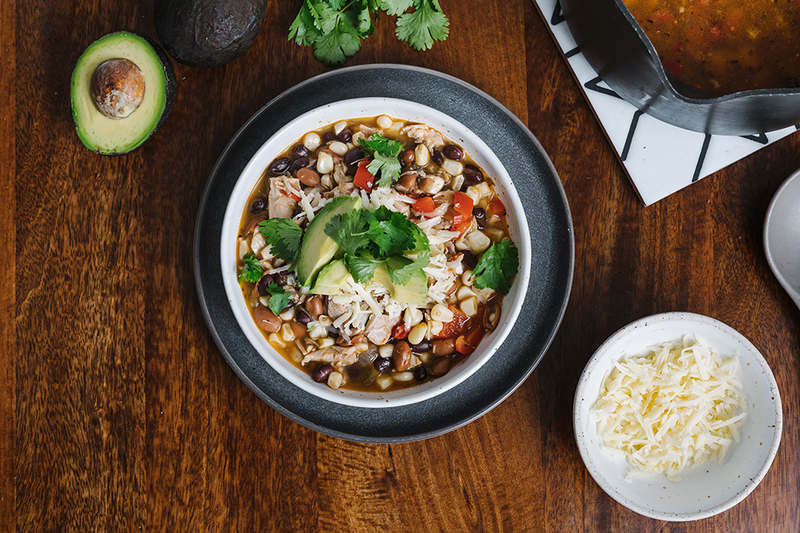 My favorite way to serve it is topped with avocado, cheese, and fresh cilantro. Finished with a squeeze of lime. Then I dip my absolute favorite cornbread in it. I love this cornbread. I have slowly perfected it and though I don’t always add roasted corn, when I do I always remember how much I love the addition. It add just a bit of texture and crunch. 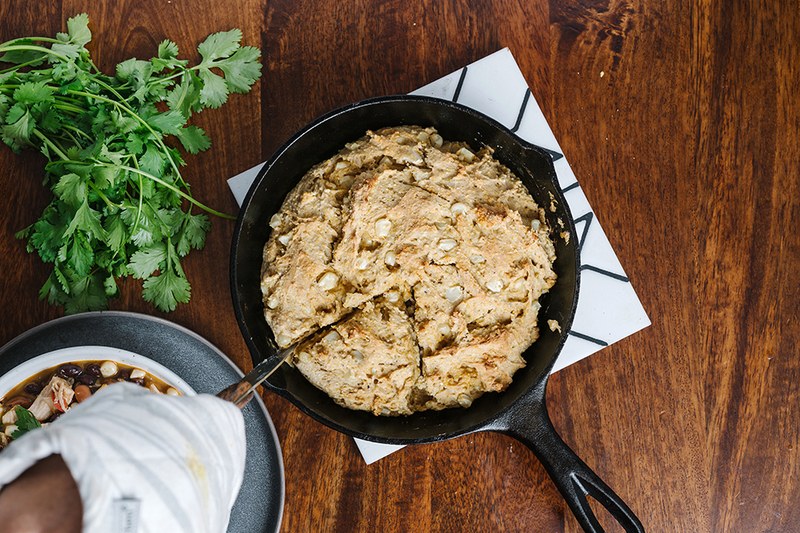 This cornbread is not dry, not too sweet, and I can’t say it enough, that cast iron skillet adds something special. Turn oven to 400 degrees. 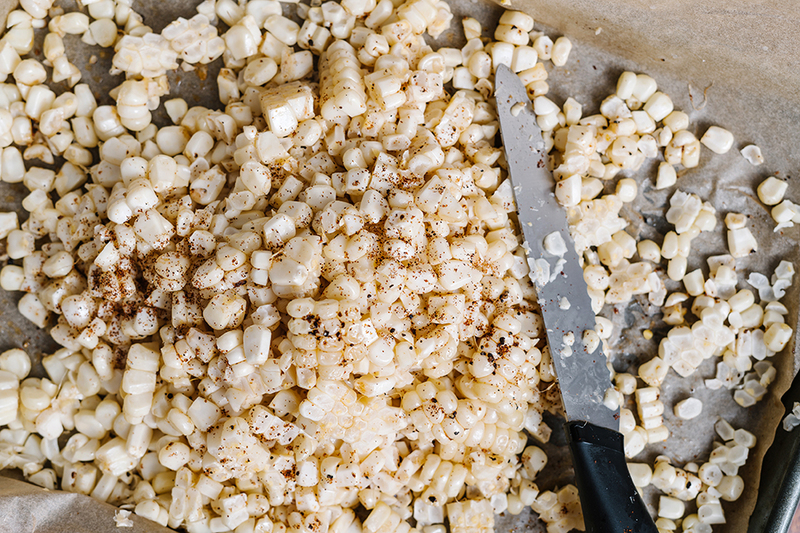 Husk corn and drizzle with 1 tbsp avocado oil, then sprinkle with salt, pepper and 1 tsp of chili powder. Roast corn for 25 minutes. 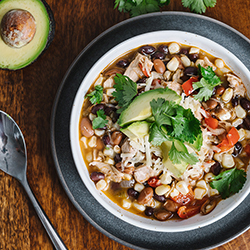 While corn roasts, in a large stock pot add 1 tbsp avocado oil of medium-high heat. Add onions, peppers and jalapeno and cook for 4-5 minutes. 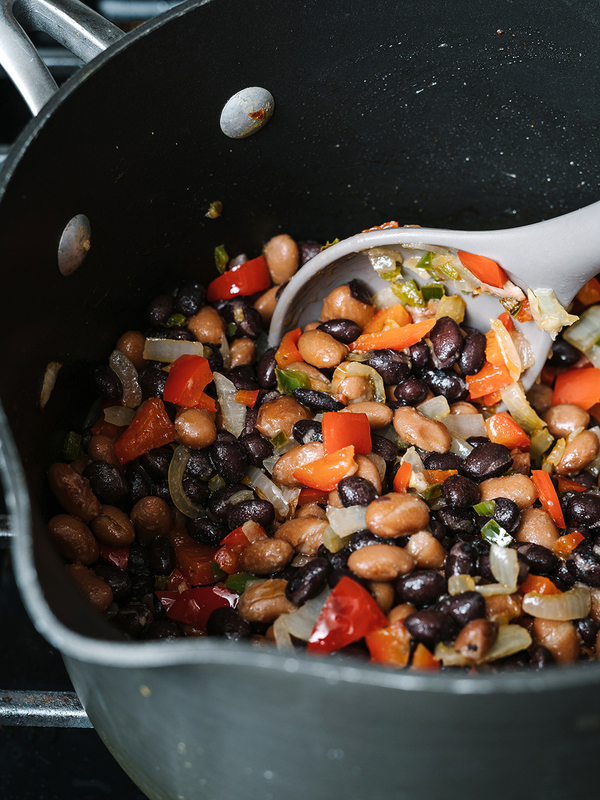 Then add beans, seasonings, and stir for 2-3 minutes. Pour in broth and lime juice and bring heat to high. Once soup is boiling, turn heat to low and allow to simmer for 20-30 minutes. 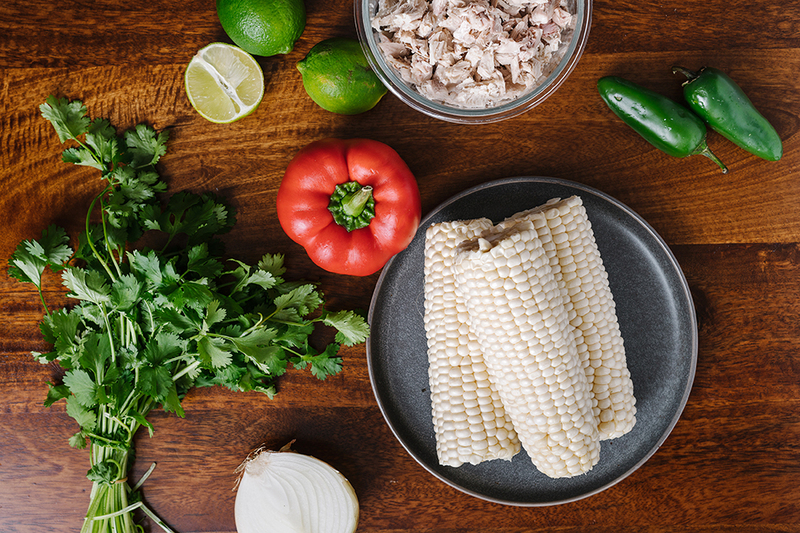 After soup has simmered, cut roasted corn from the cob and add about 2 cups to the chili along with ~3 cups of pulled chicken. Simmer for another 10 minutes. Serve garnished with cheese, avocado, cilantro and a lime wedge if desired. While soup simmers prepare corn bread. Grease a 10 inch cast iron skillet* with avocado or coconut oil. 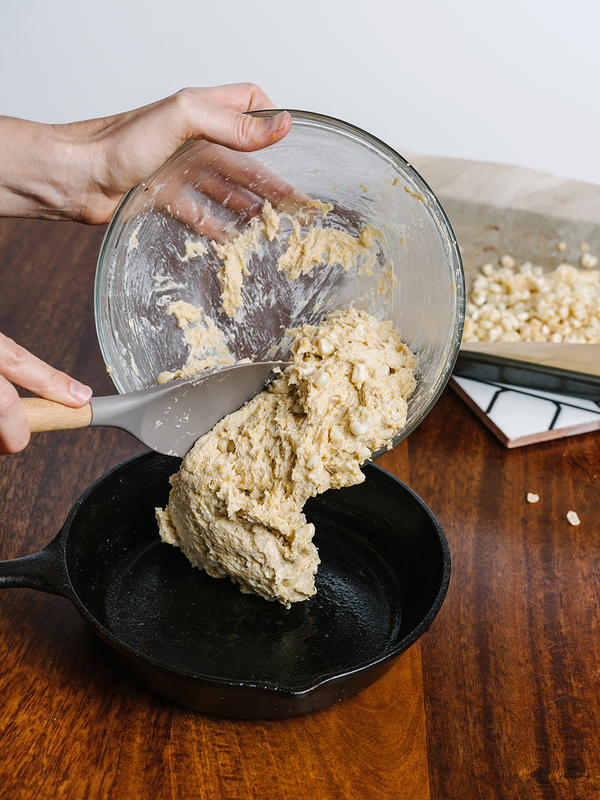 In a medium bowl, mix cornmeal, gf flour blend, salt and baking powder together. Add oil, honey, milk, and egg and mix until well combined. Pour mixture into skillet and bake for 25-30 minutes or until a knife inserted comes out clean. 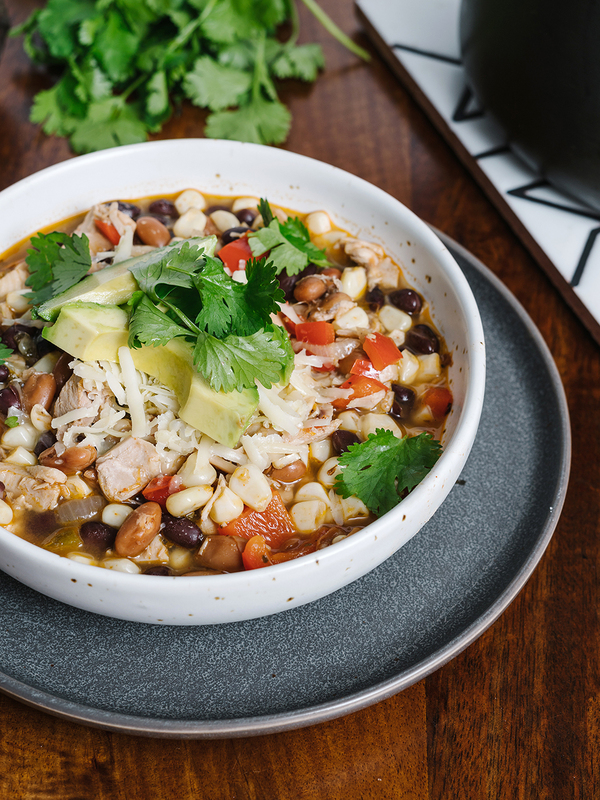 This recipe can also be done in a crock pot, add everything except for corn and chicken to your crockpot and cook for 4-6 hours on low. Add chicken and corn 30 minutes before serving. *You can also use an 8×8 baking dish you just may need to adjust your time. These both look so good! !